for one lucky reader to win! onto which laura hand-stamps images. telling me what your favorite item is from her shop. or blog/tweet about this giveaway & comment with a link. and you have until thursday, february 4th to enter. I love her little nest teapot cozy! I really like the scooter cozy!! AND I'm going to be a follower. Oh, what a day. I drink WAY too much coffee and I'd love a way to reduce my carbon footprint with my multi-daily trips to my local shop! So cute! Thanks for shing us her stuff! How cute! Ooooooh... i also love her linen pouches! But everything in here shop is very cute! I'm in love with her Linen Wallet with Zinnia on Slate! Lovely! My favorite would have to be the waterhen on hemp coffee sleeve. I've attempted to make coffee sleeves in the past but none of them have ever turned out as gorgeous as hers! PS - Not to sound like a creeper or anything...but I'm following you! I love the giveaway! I went to your shop and my fav is the Linen Pouch - Brown Owls on Lime Green. 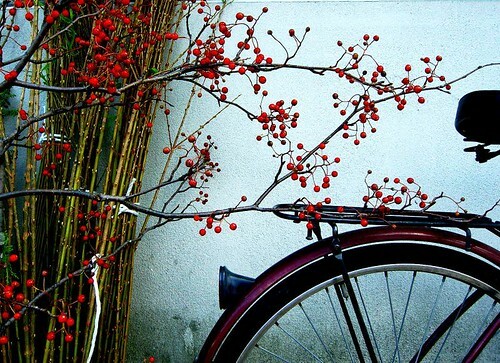 hey there...lovely blog...i just discovered it today! keep up the good work! CUTE stuff!! it's hard to choose, but i think i'll go with the eco cup cozy - white polka dots on yellow :) great giveaway meg! i am obsessed with wallets and being organized so any adorable wallet is my thing. all of her stuff is so adorable and i love that its all so eco friendly. oh my gosh cute!! i love anything with a scooter on it. and her shop is adorable! Those teapot cozies are SO cute!! Her shop is so cute, i love everything but the pins are definately my favourite! Gorgeous! I love her linen wallets and the bicycle pins! oh, and I already follow :) yay! Scooter cozy is kewl. Are we supposed to leave email addresses too? love the give away, but i have to say my fav is the "Linen Wallet with Green Dew Drops"
My favorite item is Laura's Linen Pouch with White Polka Dots on Sky Blue - lovely. Great giveaway, thanks! I've also joined your blog as a follower - I follow Laura's blog and her post sent me here. This is very fortunate as I think yours is a lovely blog and I look forward to reading more from you. Thanks! I found your blog from Kat's Books blog. What a nice blog! I admire Jennifer Garner and Ellen DeGeneres too! I really like the Cherry Blossoms on Brown Linen Pouch and the Waterhen on Hemp cozy. I chose two because there was a combo offers link too! hehe! I also became a follower. What a great giveaway. I like the cozy idea. I don't like using the cardboard cozies, but it's too hot to hold the cup otherwise! 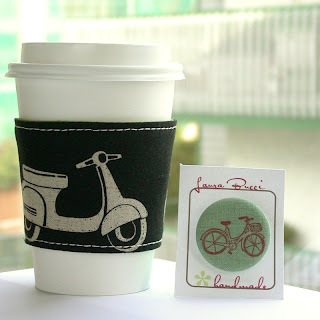 I really like the vespa cup cozies. Very chic! I love her linen wallets and pouches. All of them! I have one of her linen wallet, and it's the perfect size for my business cards - when I whip mine out, and whip a business card out of it, someone always gives the wallet a second glace. It's awesome. I feel like the most stylin' professional on the block! Her linen pouch w/ the stripes and polka dots. LOVE it. Thanks so much for the chance to win! I'm a follower, I'm a follower!!! my favourites from her shop would be the coffee sleeves and the little pouches, very cute! i personally love her cup cozies.... i own one and use it all the time when i go to tim hortons or starbucks and get so many compliments on it as well. but i also must say that i adore the linen pouches!! so handy and trendy <3 i love!!! Since I already own a cozy and bought one for my mother I will have to say that my new favorite is: http://www.etsy.com/view_listing.php?listing_id=26082969. It matches my cozy!! I now follow your lovely blog. Just started following your blog and so far ::love::!! It is absolutely adorable! the coffee cozy is sooo cute! Thanks to Laura & the link to her giveaway I discovered this great blog! Love all Laura's products, really wonderful! !